Churchnet, a Baptist network headquartered in Jefferson City, Mo., expresses its profound disappointment in President Donald Trump’s decision to increase restrictions on travel to Cuba. Churchnet leaders have traveled to Cuba on multiple occasions to partner with Cuban Baptists. Just last week, we hosted a Cuban Baptist president and another Cuban Baptist pastor who met with our Board of Directors and spoke in local churches. The Administration’s restrictions will increase costs and obstacles for churches in our network seeking to travel to Cuba and work with Baptists on the island, thereby making it more difficult to live out our religious calling. The restrictions will also hurt relations between our nation and a close neighbor. We urge the President and other political leaders to reverse these and other barriers between the U.S. and Cuba. We will prayerfully continue to visit and partner with Cuban Baptists. Josué Rodríguez Legrá & Diorlis (Joey) Hernández. 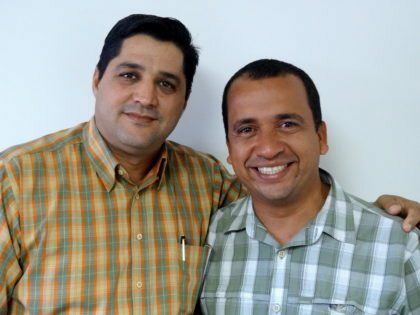 Last week, two Cuban Baptists visited Churchnet and some of our ministry partners. The two who came were: Josué Rodríguez Legrá, president of Convención Bautista de Cuba Oriental (Eastern Baptist Convention of Cuba) & pastor of 1ra Iglesia Bautista de Palma Soriano (1st Baptist Church of Palma Soriano); and Diorlis (Joey) Hernández, pastor of Sexta Iglesia Bautista de Santiago de Cuba (6th Baptist Church if Santiago de Cuba). Churchnet leaders who have traveled to Cuba since 2014 include President Forestal Lawton, Associate Director Brian Kaylor (also editor & president of Word&Way), Missional Collaboration Team Leader Gary Snowden (also associate pastor of First Baptist Church in Lee’s Summit), and Board Member Terrell Carter (also pastor of Webster Groves Baptist Church). Others who have traveled during Churchnet trips to Cuba include members of First Baptist Church in Farmington, First Baptist Church in Lee’s Summit, and Kirkwood Baptist Church, as well as leaders from ministry partners like Central Baptist Theological Seminary, Future Leadership Foundation, and The Baptist Home. Churchnet, organized in 2002 as the Baptist General Convention of Missouri, is a network that serves churches by fostering collaboration and hope for engaging new generations and cultures. Learn more at www.Churchnet.org.